It may have taken the New York Mets a few seasons to establish themselves as serious contenders in the MLB, but when the team appeared in their first playoff, they went all the way and won the World Series. The team, which earned the title of “Miracle Mets” after their 1969 season, pulled off one of the biggest upsets in World Series history when they defeated the Baltimore Orioles 4-1. The “Miracle Mets” were not a one-off team either; they won the World Series again in 1986 and were in the playoffs as recently as 2016. Although the Mets have not seen a world championship in over 20 years, they have their sights set on bringing home some hardware. With a powerful pitching staff, New York is looking to keep their division crown over the Washington Nationals and the Atlanta Braves. Grab your 2018 New York Mets tickets and head down to Citi Field to be a part of your team's home field advantage. The Miracle of 1969 – Since their inception in 1962 till 1968, the Mets had never been to the playoffs. Therefore, it’s a no brainer that no one was expecting them to win the World Series in 1969. However, the combination of solid hitting and on point pitching saw the team win 100 games in the regular season. The “Miracle Mets” as they would come to be known, consisted of ace-ball players, Gary Gentry, Nolan Ryan, Tug McGraw (country singer Tim McGraw’s father), Jerry Koosman and Tom Seaver. Once in the playoffs, the Mets swept over the Atlanta Braves 3-0 in the 1969 NLCS and then defeated the heavily favored Baltimore Orioles, 4-1, in the World Series. The Mets’ first big win in still etched in every Mets’ fans’ memory. Game Six – One of the greatest games in baseball history was played on October 15, 1986, at the Houston Astrodome. Also known as Game Six of the 1986 NLCS, the game was played between the New York Mets and the Houston Astros. The New York Mets are one of the two professional baseball franchises based in New York City, the other being the New York Yankees. Close proximity has resulted in a rivalry between teams. The Subway Series – The Mets-Yankees rivalry is often referred to as such. The two teams have frequently met each other in the regular as well as post-season games. The pinnacle of this rivalry was when the two faced off during the 2000 World Series, in which the Yankees defeated the Mets 4-1. Braves-Mets – Both the Atlanta Braves and the New York Mets compete in the National League (NL) East Division. This rivalry intensified during the late 1990s and early 2000s. It is however the Braves who lead the regular season series. Mets-Phillies – From 2006 to 2008, the Mets-Phillies rivalry was one of the hottest in the National League. This brief period was marked by both teams battling it out for a playoff position. The Phillies lead in the regular season series and also hold the record for the largest victory, 26-7 over the Mets. From 1962, the Mets have produced some of the greatest players MLB has ever seen. Following stand out as the best to ever wear a Mets uniform. Tom “Terrific” Seaver -Perhaps the greatest Met player of all-time, Seaver turned the perpetual losers into World Series Champions. As a Met, Seaver was Rookie of the Year and also won three of his Cy Young Awards with the franchise. Seaver is one of the most decorated pitchers to ever play baseball. To see history in the making get your NY Mets tickets here. Darryl Strawberry – Strawberry’s exceptional skills may have been overshadowed by his knack for falling in trouble, but he remains one of the greatest Mets of all-time. He was part of the 1986 Mets team that won the World Series. One of the greatest power hitters, Strawberry led the league in 1988 with most home runs (39). Mike Piazza – One of the greatest offensive catchers to play the game, Piazza led the Mets from the late 90s into the early 2000s. From the moment, he was traded to the Mets, Piazza became one of the most beloved Mets of all-time. If you’re fan of the New York Mets then get NY Mets Tickets and see your favorite team take another shot at the World Series. The Mets are brilliant especially when they are at home and with Jacob deGrom, Yoenis Cespedes, and Noah Syndergaard on the roster. Citi Field replaced Shea Stadium as the Mets' home ballpark in 2009. The 45,000 seat stadium opened in the same year as the new Yankee Stadium, adding further fuel to the Mets-Yankees crosstown rivalry. The Jackie Robinson Rotunda along with witnessing the Home Run Apple emerge from behind the center field wall are must sees when attending any Mets' game. With so many great teams to fill up the New York Mets schedule, fans will not want to miss one inning. Secure your seat at Citi Field this season with Mets tickets and watch the team fight harder than ever for the championship. Our process for purchasing cheap New York Mets tickets is simple and fast. There are so many online ticketing sites, that it can be hard for customers to find the right place to buy New York Mets tickets at the cheapest price. At ScoreBig we think of our customers first and foremost. We offer daily deals for New York Mets events, so our customers can get the best seats for the best prices. ScoreBig will always go above and beyond to offer the cheapest New York Mets tickets on the market. The New York Mets schedule above, displays all available events for 2019 and 2020. Once you find the event that you would like to go to, click the red “Get Tickets” button. It is located on the right-hand side of the event listing, it will take you to an New York Mets event ticket page. ScoreBig's event ticket page will display all available New York Mets tickets for that event. On the event ticket page to help with your search for the right New York Mets tickets, use the filters at the top to select quantity, price range, and more. There is also an interactive seating chart so you can pick where you want to sit. When you are ready to buy a ticket, click on the listing, and you will be directed to ScoreBig's checkout page. Upon completion of the information fields, your order will be processed and your New York Mets tickets will be delivered via email, mail, or to your mobile device. What makes ScoreBig’s site stand out from the rest? We are constantly analyzing our competitors to improve our site, service, and prices. ScoreBig.com employees strive to offer the best process and experience to buy cheap New York Mets tickets. Our goal is to get you the best seats to New York Mets events. We offer daily discounts on our site and for special promotions check out our newsletter. If there are no New York Mets events currently available, you can use our search feature at the top of the page to see a list of all popular events going on near you. No matter your price point, we have all the best deals and discounts on New York Mets tickets. For more information on prices of New York Mets tickets and the schedule for New York Mets, check out our listings above. The last thing you want to find out is when the New York Mets event you wanted to go to is sold-out. Don’t worry in many cases ScoreBig has affordable tickets to sold out events. We sell tickets from GA all the way to premium seating and parking. Skip the scalpers in the parking lot and get your tickets online from top New York Mets ticket brokers. We get you in all events, buy your New York Mets tickets here from a brand that many trust and rely on for all their ticketing needs. ScoreBig offers a 100% money-back guarantee. If you have been in search of cheap tickets for New York Mets, ScoreBig by far is the best option. That’s why ScoreBig has more loyal customers than any other ticketing site. 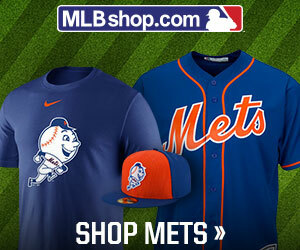 Shop at ScoreBig for safe and secure New York Mets event tickets.